I made Enchiladas in Hotdogs & Enchiladas For Danish Boys and had some of the chicken filling as well as tortillas leftover. Now, I may be an extravagant cook but not a wasteful one. Even though fridge space is scarce, I wasn’t about to just toss my leftovers into the trash. I knew exactly what I was going to do with them the next day. There was just enough chicken to fill one quesadilla which wasn’t going to feed the both of us. Fortunately, I had some fresh spicy beef sausages. Deceptive these sausages… They look like skinny regular beef sausages but they pack a fiery punch! Love them! I sliced them, fried them and filled another quesadilla. Quesadillas are very versatile. They do not have to be purely Mexican. You may fill your quesadilla with anything you want. I like to think of them as Mexican grilled sandwiches. I’ve done a breakfast version with scrambled eggs, bacon/ ham, tomatoes and cheese. My DCM liked that plenty. Veer from the Mexican route and use leftover curry or a stew as filling as well. Go crazy! Quesadillas are a lot easier to put together than Enchiladas. 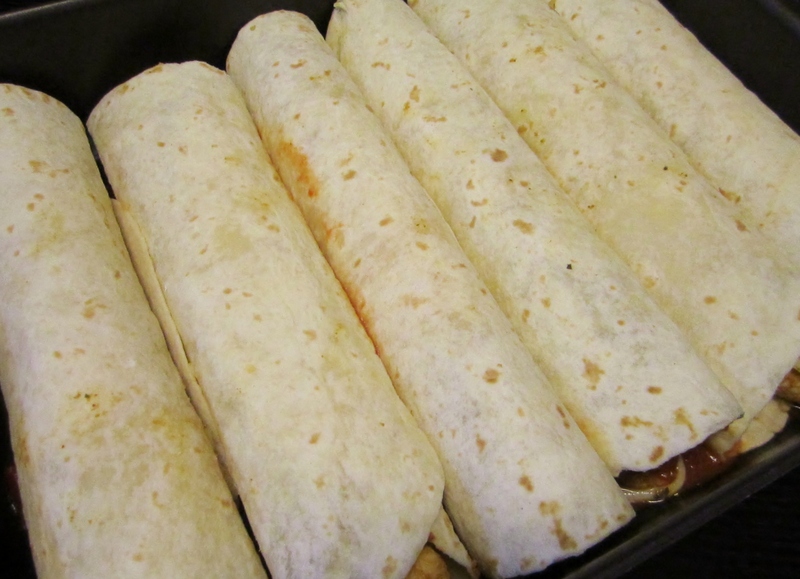 Place tortillas on baking paper on an oven sheet, layer on cheese and filling of your choice then more cheese, maybe some tomatoes, re-fried beans or salsa, top with more tortillas, and pop in a pre-heated oven (175 degree Celsius). 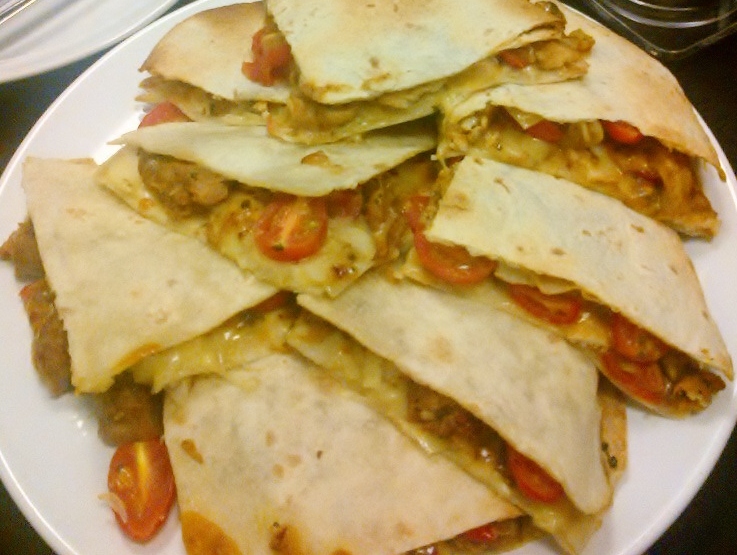 I place a sheet tray on top of the quesadillas to weigh them down as the top tortilla has a tendency to curl. This does not happen when you cook them in a pan. So there is that for another option. I prefer to just chuck them all into the oven as it saves time and effort. Serve with some salad on the side and guacamole. Enchiladas do take quite some effort and time but they are well worth it. I’ve made a simple and non-traditional version here but it is very good nonetheless. If you cannot be bothered making your own guacamole or salsa, use store-bought versions. I highly recommend El Paso. Substitute chicken for beef or even prawns. If you do use prawns, do not cook them all the way through first, make sure the enchilada sauce is hot when you spoon over the tortillas and crank the heat of your oven to the highest temperature to melt the cheese faster. You do not want to overcook the prawns. I found what I now deem as the best cheese for making Mexican food (funny it’s made by a Danish company). Arla Finello® Tex Mex cheese is cheesy. 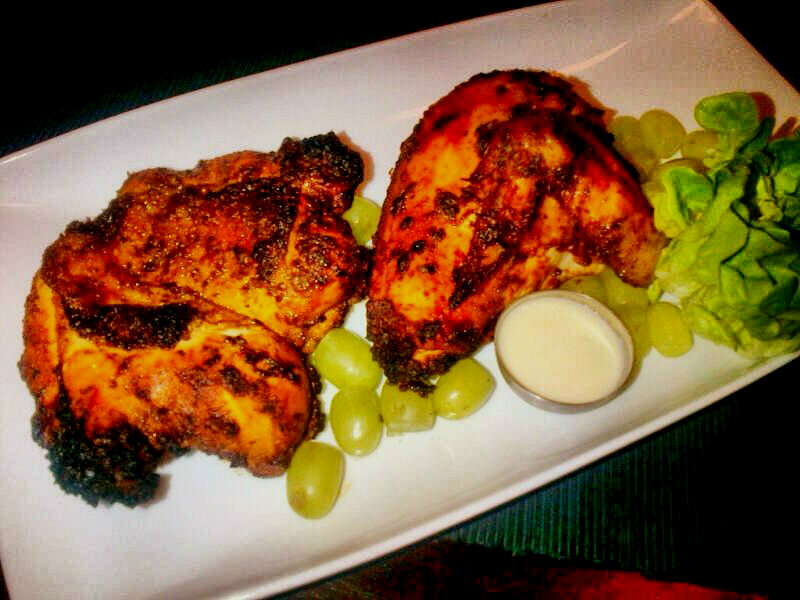 gooey, spicy awesomeness! 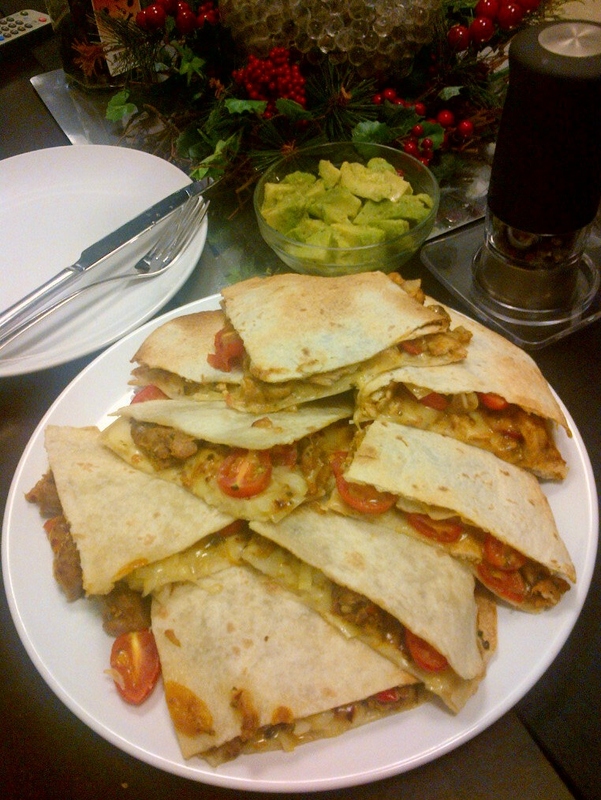 There are bits of chilli flakes and other spices mixed into the cheese which added a real kick to my Enchiladas! Combine chicken breasts, onions and seasoning; mix well to coat. Marinate for a minimum of an hour up or overnight. Heat pan with reserved oil, add a little more if you prefer. Toss well and cook through. Leave to cool to warm. Drain tomatoes and combine with remaining ingredients. Allow flavours to meld in the fridge for at least 20 minutes before serving. Allow flavours to meld for at least 20 minutes at room temperature if cooking with it. Combine all ingredients; mix well to coat. Combine canned tomatoes and Gg’s Chunky Salsa in a saucepan and cook over a low flame for 10 minutes; stirring occasionally. Mix Gg’s Chicken Enchilada Chicken Filling with as much cheddar cheese as you like. Spread a thin layer of Enchilada sauce on the bottom of a baking dish. 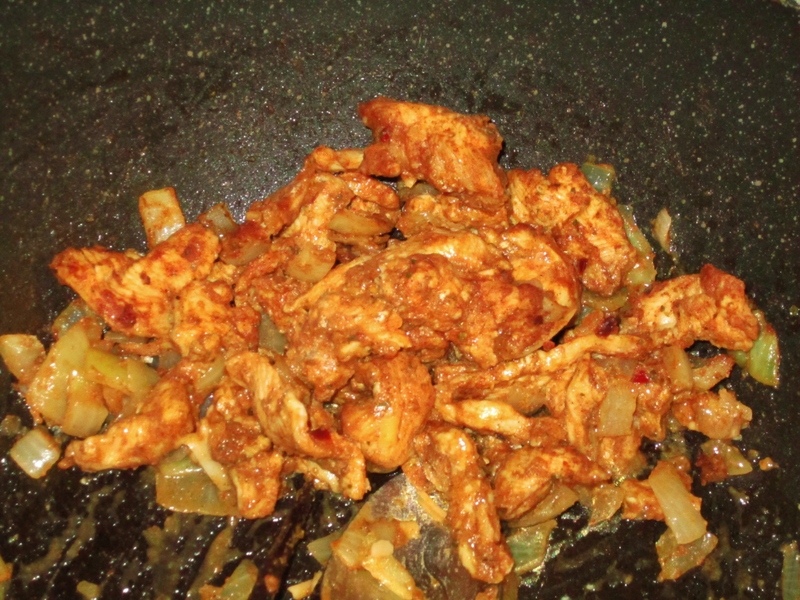 Place one to three tablespoonfuls of the chicken mixture in a straight line in the centre of a tortilla and roll it up. Place in baking dish and repeat until all six tortillas are done. Cover the tortilla rolls well with the remaining sauce. Place in the oven and cook for 15 to twenty minutes, or until cheese is bubbly and a little golden. Serve with Gg’s Simple Chunky Guacamole and sour cream. Top with sauce and cheese, bake and Si Señor! 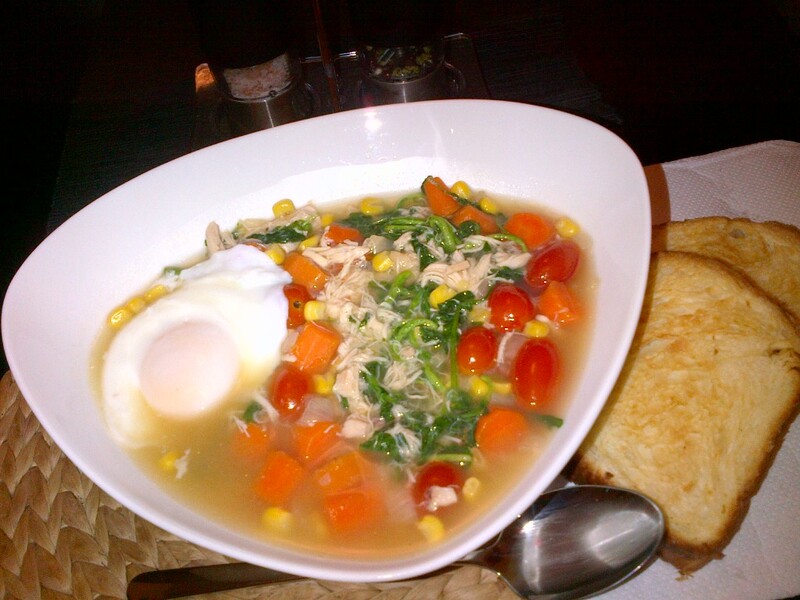 Chicken soup has to be the most versatile soup. Add what you like, omit what you don’t. Make it chunky or if you can be bothered, cut everything into bite-sized pieces. It goes with bread, pasta or rice. If you add potatoes, that saves you the trouble of cooking additional starch. 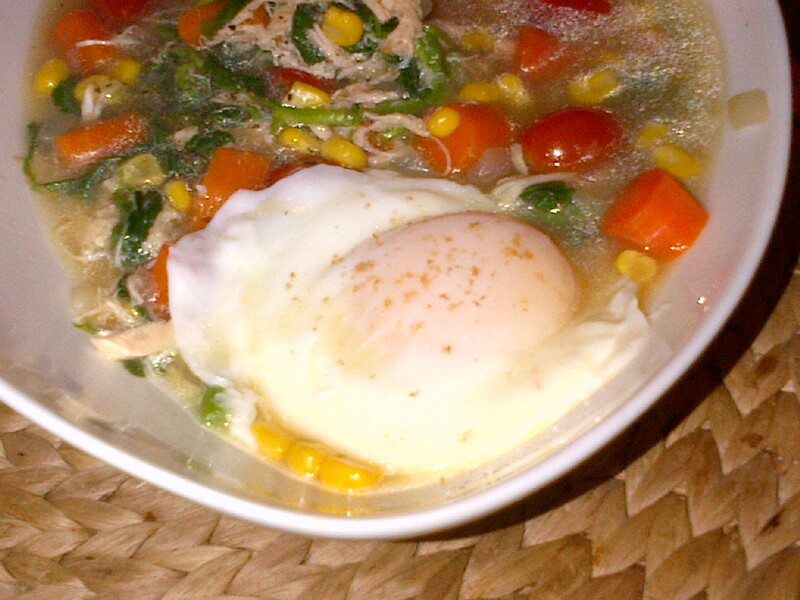 I like to add a poached egg when I serve chicken soup as my DCM likes poached eggs. Don’t wait till you feel sick to make chicken soup. I have it a lot and I never catch a cold. Combine chicken stock, carrots and onions in a pot. Bring to a boil then simmer for 15 to 20 minutes. Add additional vegetables and bring to a boil. Add chicken meat, season and serve. Chicken soup is touted for its restorative properties when one has a cold. I’m not entirely sure about that and I don’t really care. I only know it’s simple to make, delicious and healthy. I love adding lots of vegetables to my chicken soup. It almost ends up as vegetable soup with chicken. There’s the standard carrots and onions (no celery as my DCM doesn’t like it) of course. I also like adding bamboo shoot slices, broccoli, cherry tomatoes, baby Chinese spinach, corn kernels, lotus root slices, mushrooms and watercress. You can add anything you like. While all that gives the soup more flavour and texture, a good chicken soup starts with a good stock. Martin Yan said that with “a good stock, you can make a good soup”, According to him anything can be done with soup stock as “it’s like a strong foundation” from which “everything tastes good”. I concur! And you also know what else Martin Yan says right? “If Yan can cook, so can you!” That line never fails to amuse me. I digress. A soup stock consists of water, protein and aromatics. For chicken soup, I throw two to three fresh or dry bay leaves, a whole chicken breast on the bone, chicken wing tips, the chicken spine, neck and feet, an entire bulb of garlic or more simply halved horizontally with the paper left on and a knob of unpeeled ginger roughly sliced into a big pot of boiling water. There’s no fixed amount of how much of each ingredient goes into the stock. If you want a richer stock, throw in more chicken bones. If you like or do not like garlic or ginger add more or omit. If you have dry or fresh thyme, rosemary or any other herb you like, add that to the stock as well. After all the ingredients are in the pot and the water comes to a boil again, I turn the fire down as low as it can go, cover with the lid and allow it to barely simmer undisturbed for hours. Allowing the stock to boil causes it to turn chalky. This does not affect the flavour of the stock and some like it as they claim it releases collagen (I don’t think chicken has much collagen to release). I do not like a big boil as it dries the chicken meat, causes it to leave the bone and the meat sort of gets jumbled up with the other ingredients. It’s just messy. I usually start chicken soup stock in the morning and just leave it there till dinner time. At the end of all those hours of slow cooking, you get a flavoursome chicken stock with the chicken breast meat intact, tender and ready to fall off the bone. 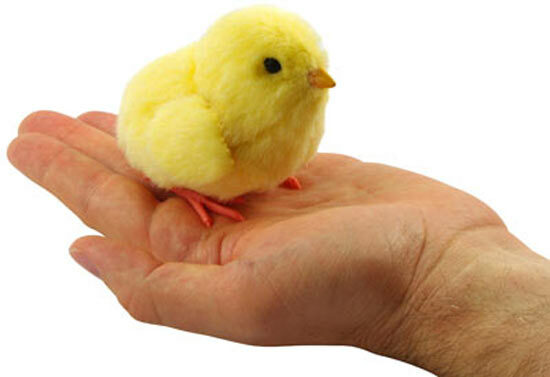 This saves on having to peel the chicken and getting my fingers and manicured nails dirty. Once the stock is strained, it can be stored away or used immediately. Chicken soup makes a good one dish meal for my DCM who likes his soup with a bit of bread. It’s light yet filling enough that should he come home late from work, he won’t feel too heavy before bed. I always make extra so I have enough for lunch the next day. See recipe here. I combined two spice rubs and voilà! Another great marinade for chicken! Once the oven is properly heated, start timer to roast chicken for 30-45 minutes. Your nose is your best indicator of whether food is cooked. 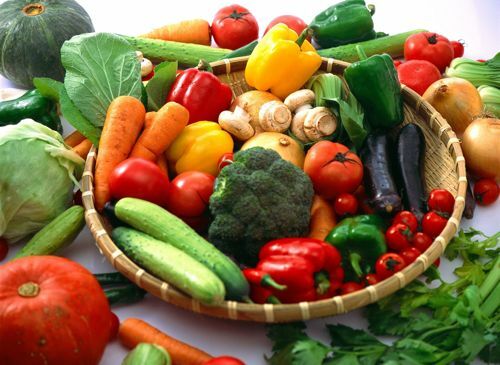 Once you can smell delicious aromas wafting from the kitchen, your food is more or less cooked. Because I hoard, I discovered there was a whole de-boned chicken breast and half a chicken breast on the bone with a wing in the freezer early in the week. I randomly defrosted and marinated them. They came in handy when my DCM said he’d be home for dinner on Wednesday. I pruned my basil plants the day before and had some leaves n the fridge. I was glad I saved them as they were used to cover the wing portion during roasting. The wings always burn before the rest of the bird cooks. This serves as a simple preventive method and flavour enhancer as the basil imparts some of its herby goodness to the chicken. 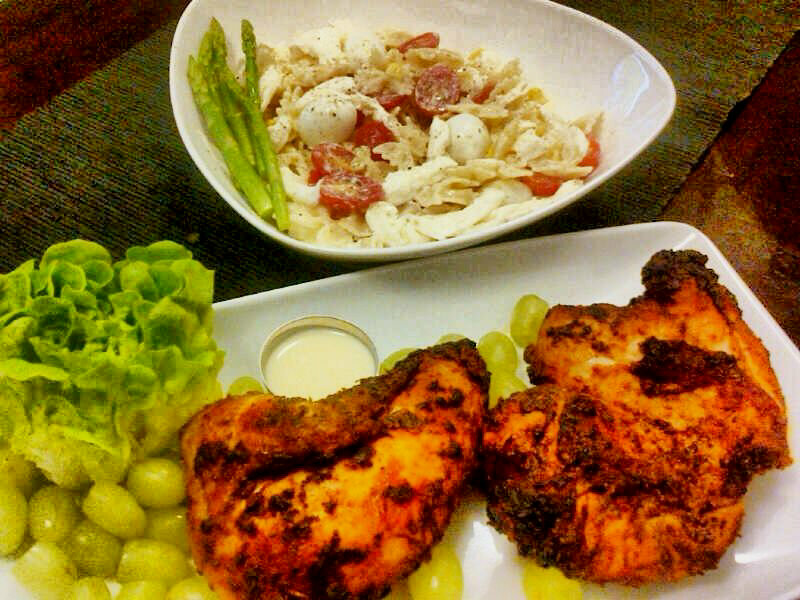 A baby buttercup and some green grapes added more freshness to the meal. See recipe here. Pasta salad can be healthier when you substitute yogurt for mayo. This yogurt dressing is also great as a cooling dip for spicy food or just to dunk vegetable sticks in. Vegetables, some quail eggs and buffalo mozzarella I found in the fridge joined the salad for added texture. I always have buffalo mozzarella in my fridge as it’s my DCM’s favourite. I decided to use it as it is a subtle enough cheese to go with the light yogurt dressing. See recipe here. I reckon a clean plate and bowl are an indication that your food was good.